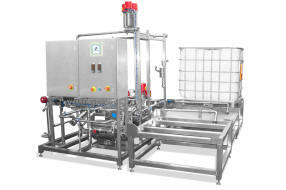 Suncombe have been manufacturing IBC handling solutions for in excess of 20 years. The IBC discharge station mounts a single or more IBCs which are connected to a transfer pump for IBC discharge. Instrumentation allows for discharge at controlled rates and sensing when the IBC is low. At this point the system can automatically switch to another IBC or come to a controlled stop. After discharge, if the cleaning option has been included, the IBC can be cleaned prior to removal and replacement. The IBC discharge station can include associated equipment, instrumentation and piping together with agitators, vent filters, mixers and metering solutions. Fitted with a stand alone or integrated control system. 3D modelled, any requirements for gantries or access platforms are incorporated, together with locations for Operator Interface and Intervention.